Editor’s Note: The Amish have been capturing the imagination of Americans for decades, challenging the status quo with their utter rejection of the ‘goods’ of modern life. The Russians have their own version of the Amish phenomenon in the face of the Old Believers, also called Edinovertsi (One-Faithers), who disdainfully turn down a sparkling, crude materialism in exchange for a strict, simple life. Old Believers are Russian Christians who did not accept the reforms of the Official Russian Church in the 1600s. Since then, they have maintained a strict, vividly separate culture and identity, settling in separate communities and farming the land. Old Believers usually have large families and dress traditionally; phones and washing machines are forbidden. Children do not attend school and are taught to read religious books in Old Slavonic, an old, complex language used in Russian Church services. Throughout the 20th century, religious persecution forced the Russian Old Believers to wander through countries and continents. Today, however, with the support of the Russian government, they have been slowly returning and settling in conservative communities throughout Russia. This is a series of mini-interviews with adherents talking about their lifestyle. This particular one explains how the Old Believers maintain a very strict, semi-monastic rule and tradition of prayer and piety. 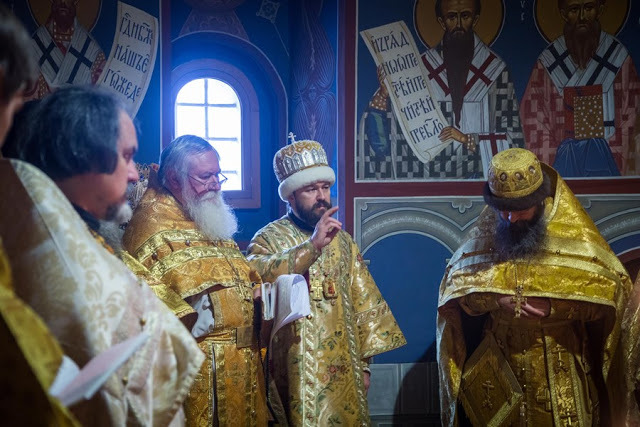 From the time of Patriarch Nikon and Tsar Alexey Mikhailovich’s liturgical “reforms,” daily life and even the worldview of the Orthodox person has changed considerably. We routinely hear from our pastors, and then from the laity echoing them: “What’s the difference, if at least there is love, and your conscience doesn’t reprove you…” and other variations on the theme of fulfilling this or that Church rule. Indeed, the two main commandments of our Lord Jesus Christ were put in these words: Love the Lord thy God with all thy heart (Mt. 22:37) and Love thy neighbour as thyself (Mt. 22:39). Without that, all of our labors on religious soil turn into legalism, hypocrisy, and phariseeism. However, our pious ancestors—and before them no less than the pious Byzantines, heirs to the works of the holy hierarchs Basil the Great, John Chrysostom, and Gregory the Theologian—tried to baptize their entire lives and everything around them. directly related with Church culture. Architecture, painting, literature… It’s as if Russia was one continuous church. Let’s not idealize it: There are times in the history of our country when many events happened that are quite bitter to remember today, but the presence of the Christian ideal as the orientation of the life of the state and society cannot be denied. There are no longer long services and plangent, angelic singing in our city parishes, and icons of the Rublev school are found far from everywhere. But grains of these olden times, of this semi-monastic life have been preserved, by the will of God, and survived to our day in the Edinoverie (United Faith, Old Rite) parishes of the Russian Church. Let the reader not be scared of the words “Edinoverie”, “Old Rite parishes”, “Orthodox Old Believers”, and simply “Old Believers”. We’re not talking about representatives of some Christian confession or, God forbid, about schismatics, but about the same ecclesial fullness. The Edinoverie arose as a movement of unity between the old and new rites already in the end of the eighteenth century. 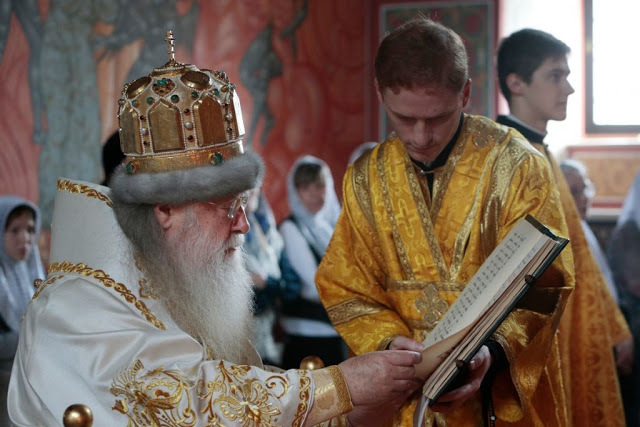 Since that time, two rites with unity of faith have been active in the Russian Orthodox Church on equal footing. 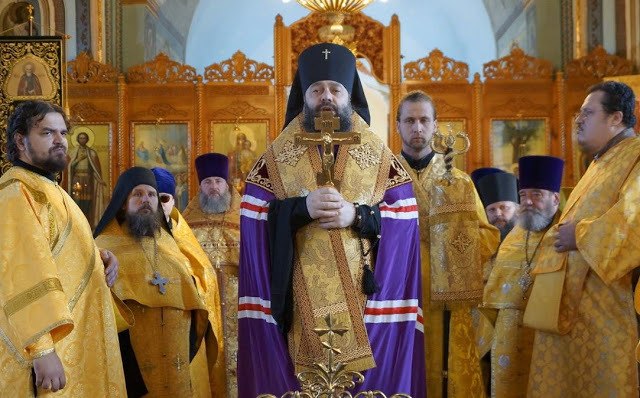 As Edinovertsi can freely visit new rite parishes and participate in their Sacraments, so the parishioners of regular Orthodox churches can freely come to our “ancient” services and even become members of our communities if desired. Edinovertsi approach the Divine services very tremulously. Having decided to go to such a church, already from the outskirts you will see parishioners hurrying to the service, like the heroes from some film on ancient Rus’. The men have unshaven and untrimmed beards, dressed in traditional untucked side-button high collar shirts, girded with a belt, and in pants and boots! Inside the church many wear black kaftans down to the floor. The woman wear sarafans and opaque head coverings, held together in a specific way with a pin, and which cover the chest and back. Married women wear a povoinik under their head covering—knitted bonnets, testifying to the wearer’s marriage. 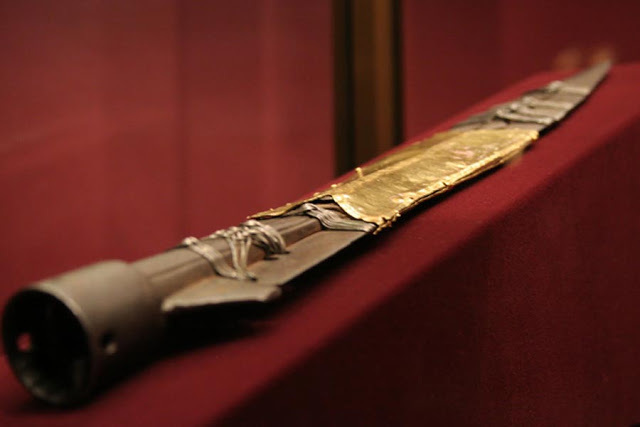 In their hands parishioners carry a long leather (as a rule) chotki—lestovka, or “ladder” prayer rope—with triangles sewn on the end. If you’re planning to go to a Edinoverie parish and you don’t have special liturgical clothing, it’s no problem. Just remember the most important rule: Clothing should be discreet and tidy, like in a regular Orthodox parish. Sleeves should be long and opaque, and women must be dressed in a skirt, and headscarves are better held together with a safety pin. 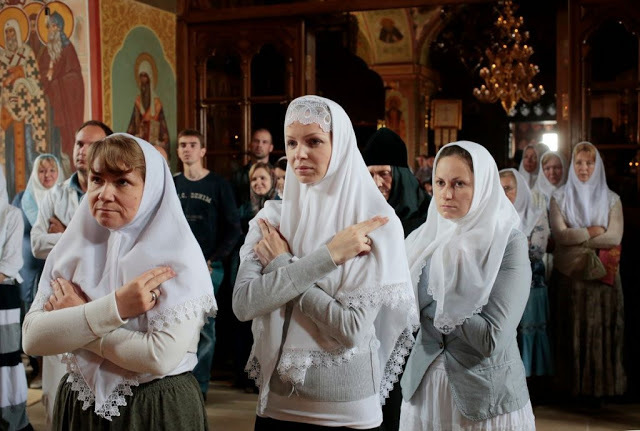 Before the entrance of the church, and entering into it, Edinovertsi make the Sign of the Cross with three bows from the waist, silently praying, “O God, be merciful to me, a sinner!” (bow). “Thou hast created me, O Lord, have mercy upon me!” (bow). “Countless times have I sinned, O Lord, have mercy and forgive me, a sinner!” (bow). They take a special embroidered prayer mat — podruchnik — from a stack usually piled up inside the entrance. Later they lay their heads and hands on it, prostrating to the ground, to preserve them in cleanliness. Men and women stand strictly on their own sides, on the right and left respectively. Extra walking around the church is best avoided. If there is enough time before the start of the service, you can sit on a bench by the wall. man to prayer, not distracting his gaze. Vegetable oil is used in the lampadas, and the candles are necessarily of wax. If they want to light candles, it’s better to do so before the start of the service. In some Edinoverie churches, before lighting a candle, they make three bows with the above-mentioned prayer “O God, be merciful…”, and also pray to the saint depicted on the icon. Lord Jesus Christ, Son of God, for the sake of the prayers of Thy Most Pure Mother, by the power of the precious and life-giving Cross, and my holy guardian angel, and for the sake of all the saints, have mercy and save me, a sinner, for Thou art good and lovest mankind. Amen. (Prostration, without the Sign of the Cross). If you arrive at an Edinoverie church after the beginning of the service, say the “Beginning” yourself, and then carefully stand in a free place and join the common prayer. Here note that parishioners stand in church with their arms folded over their chest. According to patristic interpretation, such a stance symbolizes the folding of angels’ wings, standing before the throne of God. And you will note, to your great surprise, that it’s much easier to endure the long services in this position. Don’t be confused by the differences in some words and endings of the prayers. This is how they were everywhere in ancient Rus’ until the middle of the seventeenth century. For example, you might hear the unfamiliar “… i vo veki vekom” or “And in the Holy Spirit, True Lord, the Giver of Life…” in the Nicene Creed. If you wind up at the All-Night Vigil, you will note that the people sit in Matins at the Kathismas, rising only during the “Glory” to make the Sign of the Cross. There are opportunities to sit during the reading of the instructions, if they are given. The All-Night Vigil is long in Edinoverie churches; it can take from four to six hours. However, many newcomers have noticed an inexplicable ease and even an invisible “help” in standing. Pay special attention to the kliros. There can be two klirosi—right and left, but usually there’s one. The kliros is led by a cantor, holding a pointer in his hands, with which he sets the singing, and points to important points in the hymns in the books, including when he hears if someone has slipped up. The cantor stands in the very center of the singers, and they align around him in “battle formation.” In Edinoverie churches, Znamenny singing, the main type of ancient Russian singing, coming to Rus’ from Byzantium, is used in the Divine services. The choir sings in one voice; instead of notes, hooked notation, peculiar for modern man, is used to indicate voice intervals. Even just looking at them, there inevitably arises a feeling of contact with something ancient, and at the same time eternal. Precisely such angelic singing was once heard by the ambassadors of the Equal-to-the-Apostles Prince Vladimir in the church in Constantinople. Znamenny “chant” is quite extended, ascetical, unemotional, and collected. Of course, if you compare Byzantine and Russian Znamenny singing, there are clear differences. The sound of our equivalent is free and loud, and the performance is quite strict—manifesting the national, northern color. Such singing helps the faithful to focus on prayer. The prayers are read in a special way, as well as the liturgical readings from the Gospel and Epistle and the Six Psalms. This reading style is called poglasitsi—it is a kind of word pronunciation in plain chant. Poglasitsi is used for the Psalms, the Old Testament readings, the Epistle readings, the Gospel readings, the instructions, and so on. Reprints of seventeenth century books are used in reading and singing. Sometimes you can see ancient books of past centuries in leather bindings on the analogion, with yellowed pages, and ancient ornamentation and illustrations. Before the beginning of a reading, every reader, as a rule, does a prostration on a podruchnik, and, receiving a blessing from the priest, starts to pray. The services end the same way they began—with the Seven Bow Beginning. Then the priest reads the homily from the ambo. Then the community follows into the trapeza. In some parishes, they have preserved the wonderful tradition of processing to the trapeza accompanied by the singing of the troparion of the day or feast. Before eating, all ceremoniously pray together. During trapeza you can read from a soul-profiting book, and on feasts it is customary to sing ancient Russian spiritual verses. Singing, as you know, is the soul of the people. It expresses its national character through its contents, which make you relive the events reflected in it. That is why it’s very important for Edinovertsi to sing Christian, and not worldly songs, in times of rest. This is another echo of a bygone era, and the desire to “draw near to the Kingdom of God,” Christianizing all the space around you. During Edinoverie gatherings they read the Sacred Scripture with commentaries, the lives of the saints, the works of the holy fathers, and other edifying literature. Because of the small number of parishioners, Old Rite churches are in close communication with one another, with active inter-parish cooperation. Edinovertsi of neighboring dioceses often visit one another; it can happen that faithful from various corners of the country, and even the world, come together for patronal feasts. 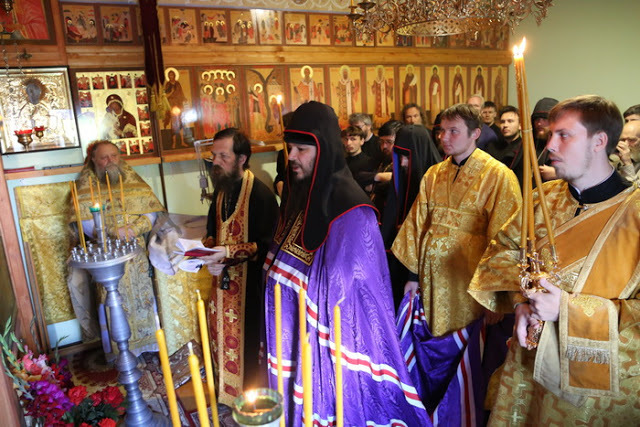 Those treasures of the liturgical and parish life that from the time of ancient Rus’ until our day have been borne by the Old Ritualists (Edinovertsi), are common to the entire Russian Church. Today they receive individual elements of Church piety in completely different churches and monasteries. Some use Znamenny singing on the kliros, somewhere they paint the churches according to the canons, others do not use electric light in the services. All these tools contribute to a better perception of God, deeper contact with Him for all those desiring of it, and for private prayer. 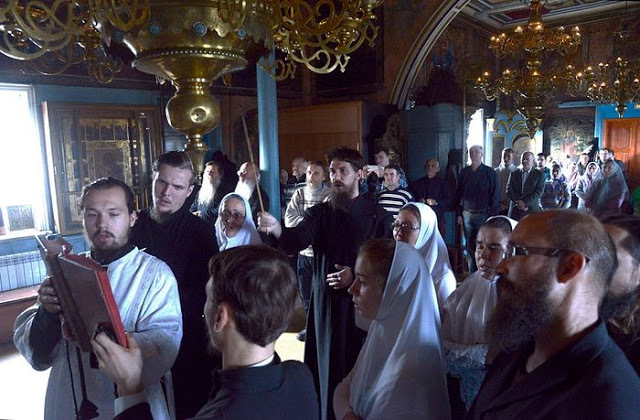 Interest in the Old Rite in the Church is growing with every year, attracting more and more supporters of a life according to the laws of ancient Rus’. May God grant that this interest not fade, but only increase, and most importantly—that it unswervingly help us all to move towards the salvation of our souls.